Stocking up on the bare basics is a must if you love to cook a lot. Dried pasta, rice, tinned plum tomatoes, vegetable/chicken/fish stock, anchovies, oil. nuts and dried herbs to name a few examples are essentials that every kitchen should have. It´s only the middle of the week and already down to basic ingredients in the fridge. 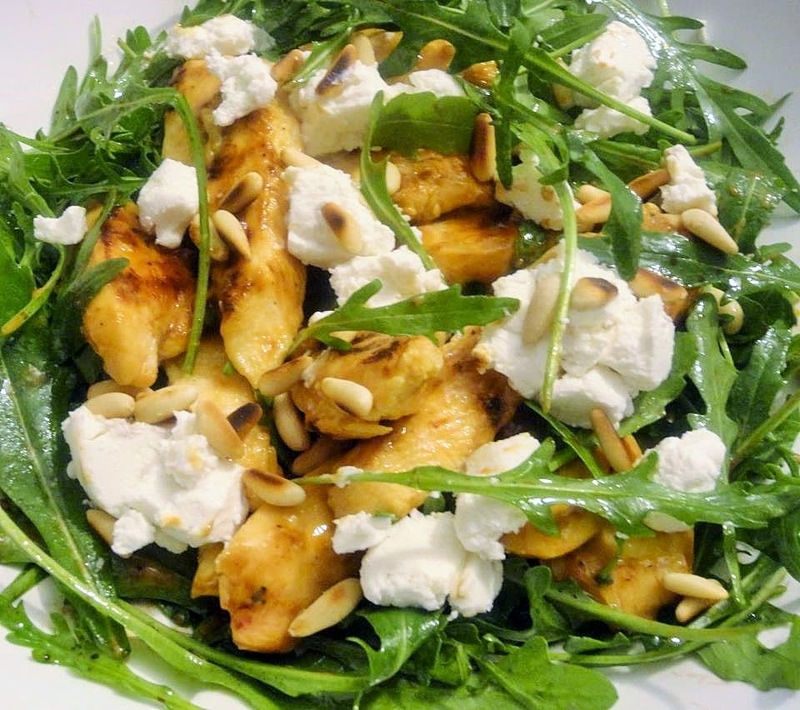 So keeping it simple and based on the fact that I had chicken breast, rocket leaves and goat cheese, I was glad I came across this recipe. It asked for the above three ingredients along with a only a few kitchen pantry essentials. This really makes a great light supper with a short ingredients list, short preparation and short cook time. 1. In a bowl, mix the honey and grain mustard and add the chicken strips. Stir the chicken strips to coat them with the honey mix. 3. With a ratio of oil to vinegar, 3:1 and some salt and pepper, dress the rocket leaves with the dressing. 4, Place the rocket leaves on the centre of each plate and then stack the chicken strips on top. Crumble the goat cheese over the top and sprinkle with toasted pine nuts. 5.Lightly drizzle some extra honey around the outside of the salad and serve.